News: Non-Active members with 0 posts have their accounts purged. If you are affected and you wish to post, please re-register. 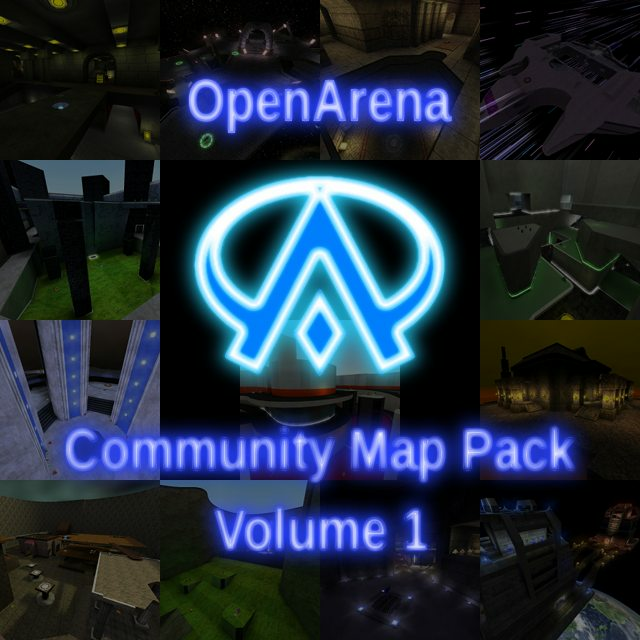 Due to some certain problems, first with a pair of bugs and then with a non-Free asset, the OpenArena Community Mappack Volume 1 had to be, well, repackaged. The good thing is that this time the 100% of it is still GPLv2-compliant. Server admins who are going to use the pack should delete the old versions of this pack (and if you were using betas, those as well) and use this new version instead. Likewise, people who's going to mirror this pack must use this version and delete the older ones. And, in the name of the OACMP team, sorry for all of the inconveniences! For information about the pack, head this way. We are also gauging interest for the second volume, so if you like to map, we're waiting for you in the Maps subforum! Want to contribute? Read this. Hey, I just got offline half day and a lot of things happened! "Oacmp-volume1-v2.zip" has got a few textures which were not GPLv2, but CC-something instead. So, NK somehow changed them with something else and re-uploaded an updated version of the pack "Oacmp-volume1-v3.zip". So, people holding v2 or previous (betas, rc), should delete them. Please, whoever uploaded the v2 pack to other sites, then delete the old one, and upload the new one. At the moment, there are various v2 mirrors still working! Who can, please pull them out/update them! Pleople will have to do not be able to download v2 anymore: please remove the old files from those servers. PS: I can't find those links now, but I remember that Akom uploaded it to mega and box.com, maybe? PPS: I just DO NOT LINK[/b]) h t t p s : / / openarena . wikia . com/index.php?title=OACMP%2FVolume_1&diff=15971&oldid=15887]updated the wiki page for V3, adding a note about deleting older versions. I suppose that note should remain in that page for at least some monts (of course, it may be better "refined" if necessary, and be kept there forever). I never want to be aggressive, offensive or ironic with my posts. If you find something offending in my posts, read them again searching for a different mood there. If you still see something bad with them, please ask me infos. I can be wrong at times, but I never want to upset anyone. Waiting for the definitive release. Gig, the older link at ModDB is already gone, I have deleted it. All that remains is Atomicgamer, which I'll do now. Mirror to download V2 from my accounts removed from my site. - http://sourceforge.net/projects/libsdl-android/files/OpenArena/0.8.8/oacmp-volume1-v2.zip/download Sourceforge (I can guess this is from Pelya). - Mega (Akom's? Removing the link from your web site isn't enough, better to also delete the file from the cyberlocker). Also, the post itself should be updated with new links. By the way, what's the exact situation of that problematic texture? XCSV sounds to be this CC replacement package, hi-res textures for Q3A. But it seems a bit strange that of all the files in XCSV folder, only one was actually taken/edited from that package. Has anyone asked Jan for infos? I'm deleting the file at the sources in my accounts. About the XCSV package, yeah, it was indeed mostly a false alarm, but a derivated texture from that NC-ND package indeed slipped out. And nobody reported this in a whole year. By the way, now we are ready ? I mean, the pack (V3) can be considered the official one ? Hey guys, I was testing the maps to place them in our *SoS*-server... and with the v1.3 mappack there is 1 problem on my machine that I got only with version v1.3(I hope only mine). All maps work apart from oacmpctf1. Screenshot loads and then OA crashes and give me an error (see attechement). With version 3, I have the same problem, which does not happen with version 2. It seems a problem that does not prevent a dedicated server to run, but prevents clients from playing (dedicated servers managers may not recognize it immediately)!!!! How's possible that just replacing a jpg file did that? Uhm... I see the v2 jpg (xcsv/metalfloor_wall_14bglow2r.jpg, right?) was 512x512, 72dpi, 24bit. V3 jpg is 256x256, 72dpi, 24bit. I'll solve this. After solving it, CAN I FOCUS ON THE OTHER THINGS I COULDN'T FOCUS YET? You know, all of this started because the guy who reported the violation said that he already knew about it while the pack was in development, but he told us about such bug only after the pack was released. And we had an entire year of development. Game Function: This is not recommended for creating jump pads and launch ramps. The direction of push can be set by the "angles" key or pointing to a target_position or info_notnull entity. Unlike trigger_push, this is NOT client side predicted and must be activated by a trigger. BOUNCEPAD : if set, trigger will play bounce noise instead of beep noise when activated (see notes). If bouncepad is checked, it will play the bouncepad sound instead of windfly. I have never checked if Jan's maps used target_push instead of trigger_push, though. I've updated my server with v3. I did not notice crash with oacmpctf1, I've tested with clean OA 0.8.8. Also, Android package and servers are updated, and include this pack. Maybe the crash happens on Windows only? It happened to both me (on two different machines) and Adriano... a problem does exist! I really think you should have waited for v4 before updating android package and servers with the pack! Neon_Knight, will you re-compile the map with the 256x256 texture, or will scale up the texture with an image editor, to have it 512x512? In case of the second one, I tried to simply scale up the red texture with Photoshop. You can find it attached here, compared with the "old" (V3) version. I haven't tried it in-game yet. UPDATE: I packaged it into a pk3 called "_test.pk3" (attached here), but the map still crashes! What do I did wrong? NK, are you sure that .jpg file was really the only one difference between V2 and V3? Uhm... looking for file dates inside V2 and V3 pk3, that one image really seems the only one modified that day... I don't understand. Don't know what to tell, but i have the same error and the game shutdown. SDL audio device shut down. @Gig @Akom Did oacmpctf1 crash when you tested it in OACMP ver2 package? Can you please check again? Also, what happens if you replace all textures with textures from OACMP ver3 package? It seems strange to me that just replacing the texture caused it to crash. Are you all really sure that there's no other "surprise" in the pack? Because I'm not going to release a v5 even if there's a big problem. I'll release a v4 tomorrow and move on to other things. I just tried to re-package the original XCSV texture (CC licensed!!!!!!) into a separate pk3, and use it together with V3.... and it works! You can download the attached file (_test2_NONgpl.pk3) for testing purposes only: it's NOT GPL (it uses a restrictive CC license instead), you CANNOT use it on GPL servers. What can make the original XCSV file so different than the other JPGs? I don't remember other problems right now.... I don't know if those brightness problems are major, you know I have difficulties in figuring out the right brighness level. PS: I will not be able to perform any more tests today. :-[ Pelya, could you please do some more?